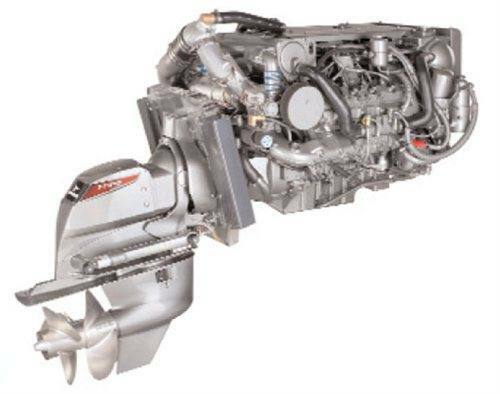 The exceptionally quiet, smooth and compact 8LV engine is EPA Tier 3-compliant. It has a wide power band, with adjustable idle speeds as low as 550 rpm for trolling speeds in the marina, and tops out at 3,800 rpm. At a 992-pound dry weight, it has the best power-to-weight ratio in its class. 12V/180A Alternator Standard - With up to 180 amps output, the alternator delivers plenty of power for today’s marine electronics and other needs. In twin applications, the use of a power inverter on smaller boats may eliminate the need for a generator, further reducing weight and cost. Twin Turbos - The twin turbos provide a wide power band. They spool up quickly for low-end torque, and deliver maximum flow at higher rpm. They also ensure quiet and smooth operation throughout the range with great acceleration. Vessel Control System - The 8LV operates on the SAE J1939 CAN Bus with data outputs in both J1939 and NMEA 2000®® protocols. Twin 8LVs connected to Yanmar’s ZT370 hydraulic clutch, counter-rotating prop stern-drives, can be fitted with Yanmar’s new Joystick control system. This allows for independent steering of the drives and independent shifting. The ZT370 gear change is so smooth that you’ll hardly feel it shift.